If there’s one way to ensure I will cry in a story, it is witnessing an act of forgiveness. There is something powerful about experiencing a true act of forgiveness that wrecks me every time. I think a big part of it is because I know how difficult and heart breaking true forgiveness really is. I also think forgiveness is what makes Christianity distinctive. Central to the Gospel is forgiveness. And this forgiveness requires death. I think forgiveness is so central to the Gospel because it is one of the most counter-intuitive things we can do as humans. In our heart of hearts, we don’t believe the world really works this way. The human impulse is that when you wrong me, I need to wrong you back to make things even. The human impulse is not forgiveness. The human impulse is justice: an eye for an eye. When we are wronged in some way, the way we want to make it right is to make sure those who have wrong me are properly punished. (Maybe this is why we like the other version of God’s forgiveness.) We call this justice. We have an entire “justice system” in our country built upon this principle. We often use justice in positive ways – working towards equality, protecting innocent people from those who would do them harm, exposing oppressive and injustice system at work, etc. Those things are really important, and are Gospel ways of living. But what we can even see on a national level now is that justice is not enough. We assumed justice had been done. We passed some laws we made some big strides. But it got left there. We assumed “justice” in the legal system was going to fix the problem. In personal situations of being wronged, when we ignore a hurt, it doesn’t go away. It stays below the surface and festers until it bubbles up and explodes. In our country, we have ignored the oppression and wrong-doing being done. It went below the surface. It festered and is now exploding. We thought justice had been done. But justice was not enough. It is not enough in political structures. And it is not enough in our personal lives. Which is why I am a follower of Jesus. Jesus wants us to move past an eye for an eye “justice.” Jesus wants to change what is inside of us. Jesus wants to help us forgive. At first glance it seems naive or one-sided to even suggest forgiveness in face of such horrific evils in our world, or the deeply ingrained hurts we have experienced in our lives. It might easily be said that forgiveness overlooks real oppression. It might be said that forgiveness allows evil to be ok, or it keeps the one who is wronged in a cycle of abuse. But this mis-understands true forgiveness. First of all, forgiveness does not mean we let people continue to abuse or hurt us. When I forgive, I am releasing myself from the power the wrong-doer holds over me. When I forgive, I am saying I will no longer let the other person’s abuse be the defining factor in my life. When I am free, I am then better able to set good limits so I do not continue to be wronged and hurt. But if I set those limits without forgiving, I am not truly free from the wrong that has been done to me. And the moment you read that and think, “Yes! Those people or that person needs to forgive” you have completely lost the plot. Forgiveness is about looking within ourselves first. 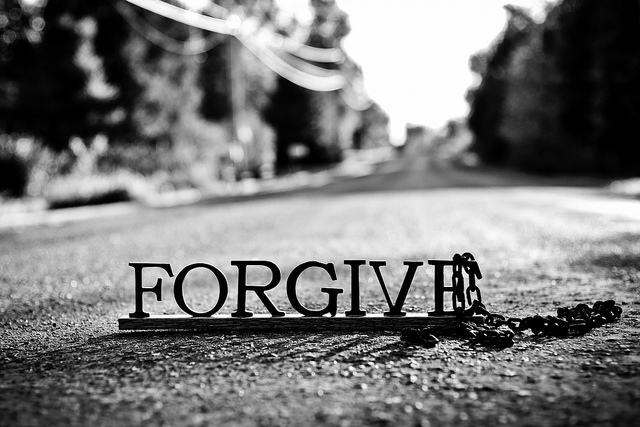 Forgiveness does not work unless we first acknowledge the real hurt and pain done to us. It doesn’t work unless we are honest with the narratives we tell ourselves about other people. Forgiveness wants to tell a new story. If I don’t first acknowledge the deep pain and hurt, then I am just glossing over it. It’s not really forgiveness, it is ignoring my pain and hoping it goes away. And we may think for a while that it has gone away, but what is really happening is that it is hiding, festering, and waiting to bubble back to surface. Sometimes this requires me to forgive. Other times, this may mean I need to ask for forgiveness. All too often we assume because we have had no personal interaction in oppression and wrong doing, it is not our problem. Other times we assume because I am the one who has been wronged, I have no responsibility in the situation. When I see or experience real hurt in the world, I need to ask for forgiveness for the ways I contribute, or the ways I try to pretend it is not there. To do any of this is a kind of death. To acknowledge the deep hurt and pain is awful. We re-open the wound and experience the depth of pain all over again. Other times we take responsibility for real hurt. We enter into another’s pain, share the load, and are honest about the ways we have been silent or complicit. We take the hurt on ourselves. But then we give it a new story. The hurt doesn’t stop or go away. But the power of the hurt does. We experience the depth of suffering so that the suffering loses its hold. The word for how this all happens is: Resurrection. With a capital R. Resurrection makes true hurt and oppression and injustice into something new. Yet, Easter without Good Friday makes no sense. When need Good Friday to understand the loss and suffering of the cross. Only then does Resurrection make sense. Resurrection frees us to be honest about our own hurt and injustice in the world. But Resurrection then empowers us to do something about it that is not glossing over or ignoring. Resurrection makes things new. Resurrection is not about bringing some people down and elevating others. Resurrection is about affirming the good and beautiful and inestimable worth of all people. Resurrection is also about living in new ways that prevent more hurt and violence to ourselves and to our world. Which is what justice is unable to do. This is why I am a Christian. We can do all of the “justice” in the world, but it will never be enough. We need better structures in our world to keep oppression at bay, we need healthy personal boundaries, but they will never be enough by themselves. We need to be released from the hurt and pain inflicted on us. We need to be honest about the ways we ignore or perpetuate hurt and injustice. Resurrection justice work begins by looking within and opening ourselves up to the forgiveness we find in Jesus. Only then can we be set free of the hurt we have experienced. And only then can we begin to do real justice work in the world. This entry was posted in Uncategorized and tagged Forgiveness, Freedom, Hurt, Injustice, justice, Oppression, Resurrection. Bookmark the permalink.